There is much religious intolerance in this new, twenty-first century. This is the tale of religious intolerance in an obscure country in East Africa called Eritrea. After fighting for its own freedom from Ethiopia for more than 30 years, this Marxist regime has forced a peace-loving community of Christians to become little more than aliens in their own land. While known the world over as a group of devoted preachers, Jehovah’s Witnesses in Eritrea have been the target of a brutal and protracted government-sponsored campaign of terror. All Witnesses have been stripped of their citizenship and the rights that go with it, apparently with the intent of breaking their faith or of wiping them out as a presence in that country. While Jehovah’s Witnesses are not the only faith under attack in Eritrea, independent human rights observers say the persecution of this group is particularly intense, extending over the better part of two decades. “Muslims and especially Jehovah’s Witnesses have suffered persecution as a consequence of their refusal to take part in compulsory military service. Persecution of Jehovah’s Witnesses is particularly pronounced given their refusal to vote in the independence referendum,” says the 2008 edition of the book Religious Freedom in the World, edited by Paul Marshall and published by the Hudson Institute, a Washington think tank that reports on human rights violations around the globe. A country of about 5 million people on what’s known as the Horn of Africa, Eritrea shares borders with Sudan to the west, Ethiopia to the south, Djibouti to the southeast, and the Red Sea to the east. As of September 2009, 60 Eritrean Jehovah’s Witnesses were known to be imprisoned for reasons ranging from conscientious objection to military service, to participation in religious activity such as preaching, to meeting in a Bible study group. More than half of the arrests have had nothing to do with participation in military service. 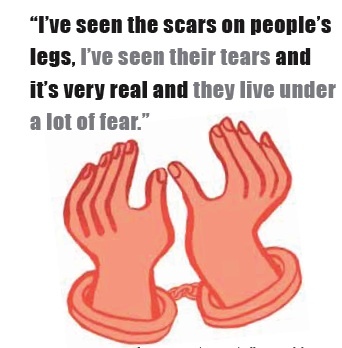 Three of the prisoners have been held since September 1994, spending the better part of their lives in prison. 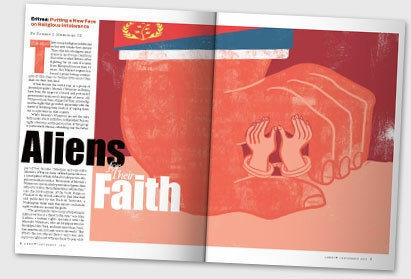 On June 28, 2009, 23 members of one congregation of Jehovah’s Witnesses in the capital of Asmara were peacefully meeting together for Bible study in a private home when Eritrean authorities raided the meeting and imprisoned Witnesses and interested persons alike. Three children ranging in ages from 2 to 4 years were among the group, which also included a child of 8, a woman over 70, and another over 80. The majority of these arrests were of women, since the government had long since arrested their husbands and sons. Most remain in prison today. This is the latest in a pattern of persecution extending back to 1994. Yet, governmental officials have rebuffed most efforts by the religious group to foster any understanding beyond what’s already known by them. And the little that the government knows, they don’t like. Jehovah’s Witnesses began showing up on the government’s radar in April 1993, when more than a million Eritreans voted for independence from Ethiopia in a U.N.-supervised referendum. That vote was the culmination of a battle between the two countries spanning some three decades and led by a man who would become president of the newly formed government. The referendum marked the embryonic stages of severe and protracted persecution of Jehovah’s Witnesses—who, for conscientious reasons, elected not to participate in the referendum. Their reasons for not voting are rooted in their stand of strict neutrality in political and governmental issues. This has been a tenet of the Jehovah’s Witnesses’ faith for nearly 100 years, bringing them in harmony, they say, with both Jesus’ teachings and the model set forth by the first-century Christian congregation. They cite the words of Jesus Christ to Pontius Pilate as recorded in John 18:36: “My kingdom is not of this world. If My kingdom were of this world, then My servants would be fighting so that I would not be handed over to the Jews; but as it is, My kingdom is not of this realm.”* Like Jesus, they obey the governmental authorities when the laws promulgated do not interfere with their obligations as set forth in the Bible. This has put them at odds with Eritrean officials, who seem to believe the state is sovereign in people’s lives—even over God. Jonah Fisher, a former BBC correspondent based in Asmara, writes that the repression of religion is a result of the government being “afraid that people who consider their highest allegiance to be God, at some point may not be patriotic and follow the state’s instructions,” according to his September 17, 2004, report published by the BBC. If the Witnesses’ nonparticipation in the referendum put them on the government’s radar, however, their firm stand against military service landed them right in the government’s crosshairs as its main target against conscientious objectors. After 30 years of war it was no surprise that Eritrea’s new leaders maintained a war mentality. Once Eritrea achieved independence, it became what Paul Marshall of the Hudson Institute calls a “militarily mobilized national security state.” This militarized state seemed bent on making an example of Jehovah’s Witnesses for their conscientious objection to military service. But the stand taken in Eritrea is not new for Jehovah’s Witnesses, who have steadfastly refused to serve in any military organization of any nation. Their stand is well known in the United States and Europe, where they have exercised their conscientious objection even in the face of death at the hands of totalitarian regimes such as the Nazis during World War II. 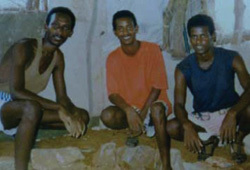 From left to right: Paulos Eyassy, Isaac Mogos, and Negede Teklemariam, imprisoned since September 24, 1994, for their conscientious objection to serving in the Eritrean military. Notwithstanding the Jehovah’s Witnesses’ long-established stand, Eritrean officials were intent on establishing their own legacy. On September 24, 1994, three young Jehovah’s Witness men were imprisoned, ostensibly for their refusal to join the military. Paulos Eyassu, Negede Teklemariam, and Isaac Mogos have been imprisoned for the past 15 years—isolated from families and community—despite the fact that the maximum penalty for conscientious objection under Eritrean law is three years. The immediate result of this decree was swift and decisive. All Jehovah’s Witnesses in Eritrea were stripped of their basic civil rights and barred from working in any governmental employment. Additionally, their business licenses, identity cards, and travel documents were summarily revoked, refused, and/or taken from them. The result has caused tremendous economic hardship in a country already among the poorest in the world. Worse, the decree marked the beginning of a dark period for Eritrean Jehovah’s Witnesses, whose families have been torn apart and disenfranchised by the merciless persecution and imprisonment of children as young as 2 and men as old as 90. The first communities of Jehovah’s Witnesses in Eritrea date back to the 1940s. But since 1995, at least 250 Jehovah’s Witness families have fled Eritrea and sought asylum outside the country because of the hardships. More than 100 Witnesses lost their employment because of their religion, affecting their immediate family and others who relied on their support. At least 38 Jehovah’s Witnesses were denied business licenses and 37 families have been expelled from their homes, with little prospects for renting a home because of the climate of hate and discrimination. It goes without saying that these government-sanctioned actions violate the Universal Declaration of Human Rights and the pledge Eritrea made when it joined the United Nations. Incredibly, Eritrea is violating its own constitution, which was ratified in 1997 but never enacted. Article 19 of the document provides for freedom of conscience, religion, movement, assembly, organization, and expression of opinion. “In reality, however, the government quashes any freedoms perceived to diminish national security or unity,” writes Marshall. One of the potential remedies available to both sides is the adoption of a system of civilian national service under the oversight of a nonmilitary branch of government. Such a system of alternative service is made available to Jehovah’s Witnesses and other conscientious objectors in countries such as Cuba, Denmark, Germany, Colombia, Taiwan, among others, according to Brumley. It has been said that Eritrean parents will quote an old Eritrean proverb to their children: Kwakolo kus bekus bougru yehahid, which means when translated, “Little by little an egg will walk.” This refers to the process by which an egg is hatched, a chick emerges, and it gradually grows into an adult, teaching a child to reach a goal by working at it day by day. Jehovah’s Witnesses are hoping this proverb holds true in their dealings with the Eritrean government—that little by little, day by day, their efforts will one day help deliver their fellow worshippers from this crucible of persecution. Robert J. Hendriks III is a freelance writer from Long Island, New York, with some 25 years’ experience in both print and television media. He has been a minister of Jehovah’s Witnesses for the past 30 years.  *Scripture quotations in this article are from the New American Standard Bible, copyright © 1960, 1962, 1963, 1968, 1971, 1972, 1973, 1975, 1977, 1995 by the Lockman Foundation. Used by permission.